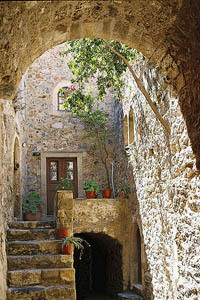 Monemvasia is a town and a municipality in Laconia. The town is located on a small peninsula off the east coast of the Peloponnese. The peninsula is linked to the mainland by a short causeway 200m in length. Its area consists mostly of a large plateau some 100 metres above sea level, up to 300 m wide and 1 km long, the site of a powerful medieval fortress. The town walls and many Byzantine churches remain from the mediaeval period. The seat of the municipality is the town Molaoi. The town’s name derives from two Greeks words, mone and emvasia, meaning “single entrance”. Its Italian form, Malvasia, gave its name to Malmsey wine. 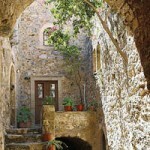 Monemvasia’s nickname is the Gilbraltar of the East or The Rock. 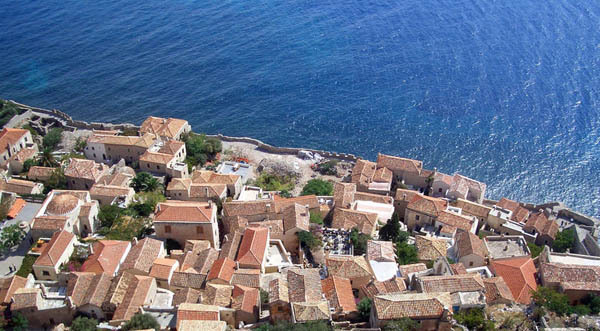 The town is built on the slope to the south-east of the rock, overlooking Palaia Monemvasia bay. Many of the streets are narrow and fit only for pedestrians. A small hamlet of about 10 houses lies to the northwest. 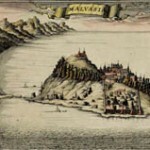 The town and fortress were founded in 583 by people seeking refuge from the Slavic and the Avaric invasion of Greece. A history of the invasion and occupation of the Peloponnese was recorded in the medieval Chronicle of Monemvasia. From the 10th century AD, the town developed into an important trade and maritime centre. The fortress withstood the Arab and Norman invasions in 1147; cornfields that fed up to 30 men were tilled inside the fortress. William II of Villehardouin took it in 1248, on honourable terms, after three years of siege; in 1259 William was captured by the Greeks after the battle of Pelagonia and in 1262 it was retroceded to Michael VIII Palaiologos as part of William’s ransom. It remained part of the Byzantine empire until 1460, becoming the seat of an Imperial governor, a landing place for Imperial operations against the Franks, the main port of shipment (if not always production) for Malmsey wine, and one of the most dangerous lairs of corsairs in the Levant. 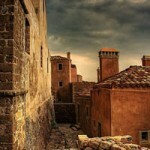 The Emperors gave it valuable privileges, attracting Roger de Lluria who sacked the lower town in 1292. The town welcomed the Catalan Company on its way eastward in 1302. In 1397 Theodore I Palaiologos deposed the local dynast of Monemvasia, who appealed to Sultan Bayezid I and was reinstated by Turkish troops. In 1419 the rock appears to have come into the possession of Venice, though it soon returned to the Despot. About 1401, the historian George Sphrantzes was born in the town. 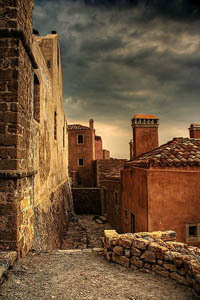 After the fall of Constantinople Monemvasia held out against the threats of Sultan Mehmed II in 1458 and 1460, when it became the only remaining domain of the Despot of Morea, Thomas Palaiologos, claimant of the Imperial throne. He had no forces to defend it; he offered it to the Sultan, and finally sold it to the Pope. By 1464 the inhabitants found the Pope’s representative feeble and the Pope unable to protect them; they admitted a Venetian garrison. The town was fairly prosperous under Venetian rule until the peace of 1502-3, in which it lost its farm lands, source of its food supply and of Malmsey wine. The food had to come by sea or from Turkish-held lands, and the cultivation of wine languished under Turkish rule. 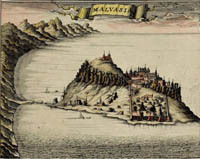 The rock was governed by Venetians until the treaty of 1540, which cost the Republic Nauplia and Monemvasia, her last two possessions on mainland Greece. Those inhabitants who did not wish to live under Turkish rule were given lands elsewhere. The Ottomans then ruled the town until the brief Venetian recovery from 1690, then again from 1715 to 1821. It was known as “Menekşe” (“Violet” in Turkish) during Ottoman rule and was a sanjak centre in Mora province.